Between 1964 and 1973 the United States conducted a secret air war, dropping over 2 million tons of bombs and making tiny Laos the most heavily bombed country in history. Millions of these 'cluster bombs' did not explode when dropped, leaving the country massively contaminated with 'bombies' as dangerous now as when they fell 30 years ago. 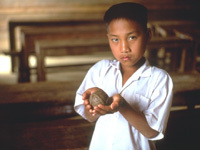 Bombies examines the problem of unexploded cluster bombs through the personal experiences of a group of Laotians and foreigners and argues for their elimination as a weapon of war. Unfortunately they are still a standard part of the US arsenal and were dropped in Kosovo, Afghanistan and Iraq. "If you want to know what Afghanistan will be like in twenty years, watch Bombies. In a cohesive, well-documented approach, Bombies beautifully captures the history and effects of the U.S. carpet bombing in Laos...The fresh material, beautifully filmed, made us want to watch from start to finish again and again." "Bombies is not soft entertainment. It shows interviews with angry, impoverished Laotian villagers. It follows a seemingly endless trail of brightly-colored unexploded bombs -- a kind of perverse Easter egg hunt -- in bamboo trees, school playgrounds, rice paddies, under houses, everywhere...There is a final message in Bombies...It is that the story of cluster bombs has been replicated across the globe...in Kuwait, Iraq, the Falklands, Ethiopia, Sudan, Sierra Leone, Chechnya, and Kosovo. Today, the United States is also using them in Afghanistan." "What's worse than a nine-year secret war targeting millions of innocent civilians? This film documents the horrors Laotians face as, thirty years after the fact, US bombs continue to kill and maim the innocent." "Just when I thought I was immune to another surge of outrage, I watched the video BOMBIES, and succumbed to a wrench of emotion that left me tearful and determined to keep on doing whatever I can to counteract the inhumanity characterizing war in this century." "The most appalling episode of lawless cruelty in American history [is] the bombing of Laos."